ProFractional laser therapy safely and effectively tightens tones and improves the overall appearance of skin in almost all areas of the body. What is ProFractional laser skin firming therapy? ProFractional laser therapy by Sciton® is used to safely and effectively tighten, tone and improve the overall appearance of skin on almost all areas of the body including the face, neck, abdomen, legs and arms. The treatment uses “fractioned” laser resurfacing, which means that only a portion of the skin is treated during a single session. Because only a fraction of the skin is treated at a time, the surrounding tissue promotes rapid healing, which in turn causes an increase in collagen growth as is normal during the skin’s natural healing process. Collagen continues to build and improve the appearance of the targeted area months after treatment. A thorough consultation is an important first step when deciding if ProFractional laser therapy is the right option for you. We thoroughly discuss your desired results and provide an honest, professional opinion on how best to achieve those results. We also make certain that you are a good candidate for treatment, taking into account your skin type, age, health, medical background and other factors that could affect the safety and effectiveness of your treatment. All of our consultations are conducted with the goal of making sure our patients feel comfortable, confident and informed about ProFractional laser therapy. Your skin is cleansed and your eyes are covered with protective safety shields before the treatment begins. Your RTH technician will customize your treatment specifically for your skin type. When it is time begin, a laser hand is positioned gently on the skin. When the laser energy is applied to the skin, you will hear a rapid succession of snapping sounds. The hand piece will continue to move until the entire treatment area has been covered, ablating pinpoint-size channels in your skin to achieve the desired results. Because only a fraction of your skin is being directly treated with the laser, the surrounding untreated tissue promotes rapid healing. The skin’s natural wound healing response creates new collagen, which then adds to the firmness and resilience of your skin. A powerful cooling technology is applied before, during and after treatment to provide a safe and comfortable session. ProFractional laser therapy is widely regarded as a comfortable treatment and usually tolerated with the use of a topical numbing cream or local anesthetic depending on the depth of the treatment. Depending on the size of the treatment area, a ProFractional laser therapy session takes between 15 and 30 minutes. Immediately following treatment, you may experience mild redness and a sensation similar to a sunburn. Your after-treatment care may include pain relief medication and an ointment to keep the skin moisturized. Your skin will be sensitive to ultra-violet light, so it is very important to avoid sun exposure until you are completely healed. Complete healing typically takes a few days. Most patients return to normal activities and apply makeup a day or two following treatment. Swelling is also normal and will subside in a few days. Results do vary, but most people report smoother, tighter skin with an overall improvement in texture and appearance. The true benefit of ProFractional laser therapy is the collagen remodeling that continues to build and improve during the four to six months following your treatment. During your consultation, we will thoroughly explain what results to expect. We also can customize a skin care product regimen that will help to enhance and sustain your results. Q: Is ProFractional laser therapy right for me? If you want to quickly tighten and tone the skin on your face or other areas of your body, ProFractional laser skin therapy may be the right option for you. ProFractional laser therapy is effective on all skin types. Q: Why choose RTH Plastic Surgery for my ProFractional laser skin therapy? 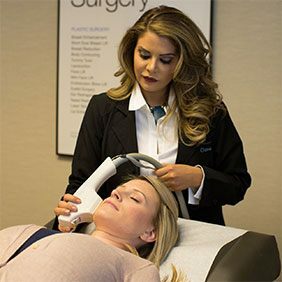 When choosing a cosmetic professional for your ProFractional laser skin therapy, there are three important qualifications to consider: training, experience and personal attention. Your cosmetic technician should be overseen by a plastic surgeon who has completed an accredited plastic surgery residency program and is board certified by the American Board of Plastic Surgery (ABPS). Above all, your cosmetic professional should be someone you trust to deliver exceptional results and perform a safe and effective treatment. At RTH, our cosmetic technicians are ProFractional laser therapy specialists with years of experience performing the treatment. We spend the necessary time with every patient to answer any questions and address any concerns. We make it a priority to ensure our patients are well-informed and completely comfortable with their decisions. We know that your time is valuable, which is why we maintain an efficient treatment calendar and use the latest techniques and technology to maximize your results. Q: Will my insurance cover ProFractional laser therapy? Insurance companies commonly do not cover an elective or cosmetic treatment like ProFractional laser therapy unless it is performed to correct a medical or health condition. If you plan to use insurance as payment, we strongly suggest consulting with your provider to discuss if the treatment is covered in part or in full by your current plan. Q: Will my ProFractional laser therapy results look natural? ProFractional laser therapy is a non-invasive treatment, providing results without the need for any surgical procedures, thus eliminating the possibility of scarring or other signs that a treatment was performed. During your consultation, we will thoroughly explain what results to expect. The longevity of results varies and is dependent on the amount of excess fat, the laxity of the skin and skin type. Typically, you can expect ProFractional laser therapy results to be long lasting provided you maintain a healthy lifestyle. Q: Can I have additional treatments in combination with my ProFractional laser therapy to enhance results? Yes, your RTH doctor can recommend additional services that may enhance your desired results including chemical peels or other skin care treatments.